One of the most common things HP printer owners want to know is how much ink is left in their cartridges. Although some units make it very obvious when they are running low, some don’t. When you encounter issues such as faded color when printing, for example, the cause could be as simple as low ink levels, but you need a way to check them. HP inkjet printers usually offer multiple ways to monitor ink levels, making this information easy to find. Below is a general explanation of a few methods for checking the amount of ink in your cartridges. Though this won’t work for every HP inkjet or deskjet printer, it will work for most. If your HP inkjet printer has a control panel display, you can often check the ink levels right from there. For some models, there is a graphic on the main screen displaying the ink levels, while others require you to dig into the menus a bit. Consult your manual for specific instructions for your model, but here is the process for many inkjet models. Highlight “Tools” and press the OK button. Highlight “Display Ink Guage” and press the OK button. The levels of the different cartridges will be shown on the screen. Many HP inkjet printers can run a self-test process and print out the results, which includes the level of ink remaining. 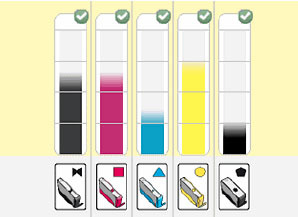 For many HP inkjet and deskjet models, you can simply hold the Resume button until the self-test page starts printing. For other models, see HP’s Printing Internal Tests page for specific instructions, or consult your manual. Click on the “Start” button and choose “Control Panel”. Click “View Devices and Printers”. You will see a list of the printers installed on your machine. Right-click the printer you wish to check and click “Printing Preferences”. Click the “Services” tab and choose “Service this device”. Click the “Estimated Ink Level” tab to view the ink levels. HP provides multiple options for checking your ink levels, so one or more of the methods above should work for most models. The instructions are not universal for every model, however, so you may need to consult the manual or contact HP support for more specific instructions.